If your home are surrounded with a good topsoil base, then you are lucky that you will have a good lawn as this has helped you in keeping you lawn beautiful. Unfortunately, many of us do not have such privileges and if we have , we still have to work hard to keep our lawn and garden beautiful. Here are some tips on how to make your lawn and garden beautiful. When it is cool and dry, start to mow the lawn. The best period is after the morning dew dry off and before the afternoon heat takes on. Otherwise, later afternoon or early evening would be good too but that if there is watering in the morning. Rather than a fence , use a hedge for better boundary divider. It can provide better privacy , keep pets and children from in and out of the home, attract birds to its shelter and accommodate good backdrop for plants and flowers. Make the beauty of your garden alive. Plant hyacinths near the walkways and doors. This will bring a magnificient perfume which will swamp the spring air and you will feel the beauty of the garden deep in your heart. Decorate your garden with non-garden item such as mail boxes and lamp-posts. Surrounding it, plant as many flowers of various type from the earliest to the latest flowerings. Decorate with white snowdrops, purple and gold corcus, blue hyacinths and various colored tulips. Add some rocks on the ground to make it more interesting. How to control the weed? Simple. Always mow your lawn during spring. This will deter dandelions spreading by eliminating the yellow blossoms and preventing seed formation. It is best to mown your lawn during late spring and early summer. At this condition, grass blades can easily shade the ground and thus prevent crabgrass from sprouting. Part of the source of pride and beauty is your lawn and garden apart from your beautiful house. It is not necessary to spend money on expensive fertilizers and herbicides or fancy lawn accessories. 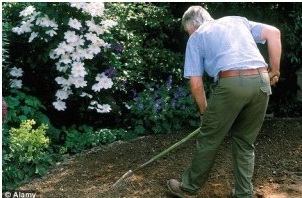 A simple and little common sense may make your lawn and garden look much better.